Welcome to the fourth installment of my blog about gematria, the Merkabah and the birth of the alephbet, and a happy Hanukkah to you all. Yesterday I gave you the Genesis alphabetic acrostic to contemplate, but today I’m going to attempt a brief potted commentary on it, although its really something I feel should be expounded upon by a more learned soul than myself. I’m not going to throw open all the gematria of the first two chapters of Genesis for you, because that would deprive you from the fun of finding out new things about the Torah for yourself, but I will point out the most interesting or pertinent information as I can. Let Us make man in Our image, according to Our likeness; and let them rule over ‎the fish of the sea and over the birds of the sky and over the cattle and over all the earth, and over ‎every creeping thing that creeps on the earth. ~ we already know that the fish of the sea and the birds of the sky were created with the Vav, and that the cattle and creeping things were created with the Zayin; so with the Cheth ruling at the head we have the word חזו meaning vision or appearance. 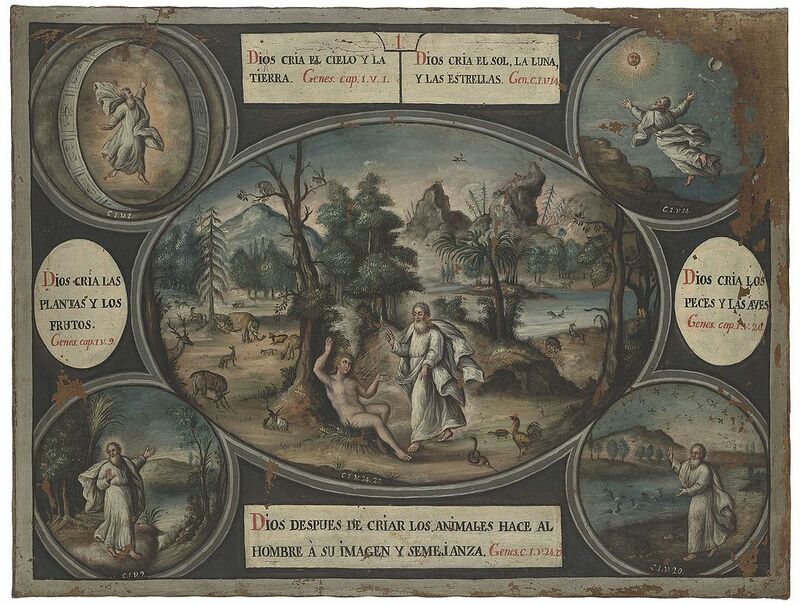 The verses of Genesis, and indeed all the Torah were first publicly numbered (as we find them today) by Robert Estienne (Robert Stephanus) in 1571, but the ‎move was not without criticism at the time from traditionalists. The manuscripts that he worked from did not ‎contain the chapter and verse divisions in a numbered form. The progression through the alephbet in Genesis starts with a Beth (2) for the Seventh Palace (at the top) rather than an Aleph, though Aleph (1) is the smaller number. There are also two Alephs for the two Palaces directly to the left and right of the Beth, as if Beth had been split into two, like a new shoot, to form the Palaces of the Alephs; of Day and of Night. Beth is also the letter that begins the Book of Genesis with the word בראשית, which has the value of 220 [and 220/7 gives a pi approximation]. The Seven Palaces with Gate correspondences. The Creator told her, “Aleph, Aleph, although the world was created with the letter Bet, you will be the head of all the letters, for there is no unification in Me, except in you. 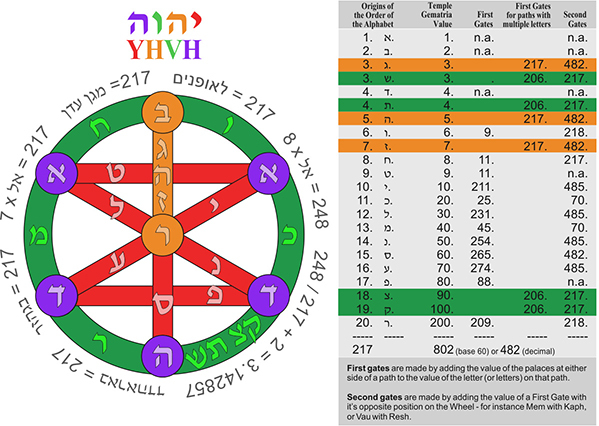 In you will all calculations begin, all the works of the people of the world, and the whole unification is only in the letter Aleph.” ~ Sepher Ha Zohar. The letter Beth means “house” or palace and it was where Elohim was thought to dwell in the thick darkness of the watery expanse that the ancients believed surrounded the earth. It is from this Seventh Palace that he began his work to create the Heavens (or the Sky) and the Earth with his sacred signs. 365 + 248 = 613. Beth ~ Gods house, everything in Heaven and Earth. Aleph ~ Light/ Day and Night. Gimel ~ Sky / Heaven. Shin ~ Fire / Dryness / Heat. Daleth ~ Doors into and out of the world. Tav ~ the Measurement of Solar and Lunar Time. Heh ~ Stars and Starlight. Vav ~ Birds, Fish and Sea Monsters. Zayin ~ Cattle and Insects. Cheth ~ Sight, Vision, Appearance, Prophesy, Man. Yod ~ Rest and Contemplation. Kaph ~ Mist, Rain, Desire. Lamed ~ The breath of Life, Ruach. Nun ~ Life, but also Death for all living things under the Sun. Samekh ~ the great River. Tsade ~ Childbirth, because Eve is regarded as the first birth according to Kabbalah. Qoph ~ Moon / Eve / female. Resh ~ Sun / Adam / male. The letter Daleth needs a little further explanation; as it is assigned to two Palaces, but only one of them – the one to the left – is being discussed in her verses. This Palace represents the door through which all things enter into the world from heaven. It’s twin on the right side is the door through which all things exit the world and enter heaven. In these verses, though they seem to be about the creation of trees and vegetation in the world, the take away is that it is the first time God has caused anything to live upon the earth and so it is the first time one of these doors are used. A note to say about Teth. Because these verses begin with the word “behold” הִנֵּה֩, which is a word that indicates there is gematria to follow, we must total the gifts that Elohim has given to man. One more matter of note is the origin of the letter Tsade. This has long been an open question to attract a great deal of debate so I feel quite free to offer the unusual but logical suggestion here that the letter Tsade may have started off life as an image of an ancient vaginal specula. I hope you’ve enjoyed this installment as you navigate your way through the gematria of the Torah. Tomorrow I’ll be discussing the relationship of the tabernacle and first temple to the Seven Palaces, and on Thursday this will be followed by a discussion about the implications for the long planned for Third Temple. So stay tuned for more numerical liquid gold.